when she first came home to us! 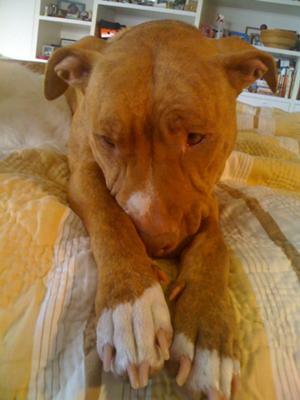 Slade is a beautiful red nose pitty who was found as a young puppy roaming around the streets of downtown Los Angeles. She was rescued by a wonderful group called Downtown Dog Rescue and my family adopted her when she was about 8 months old. 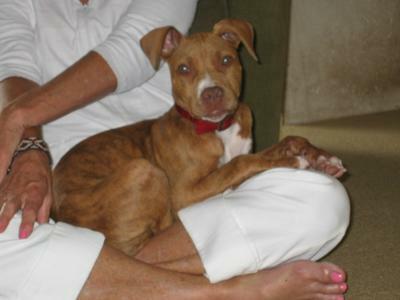 She has several brothers & sisters to play with and gets along well with all of them. 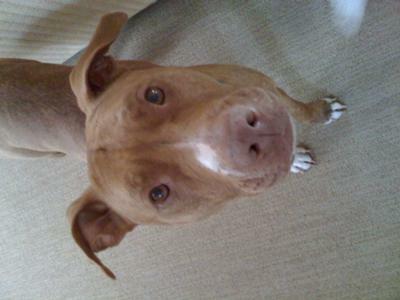 Slade is now 5 years old, still rather fearful, loves to sleep and is very friendly. We love her deeply.